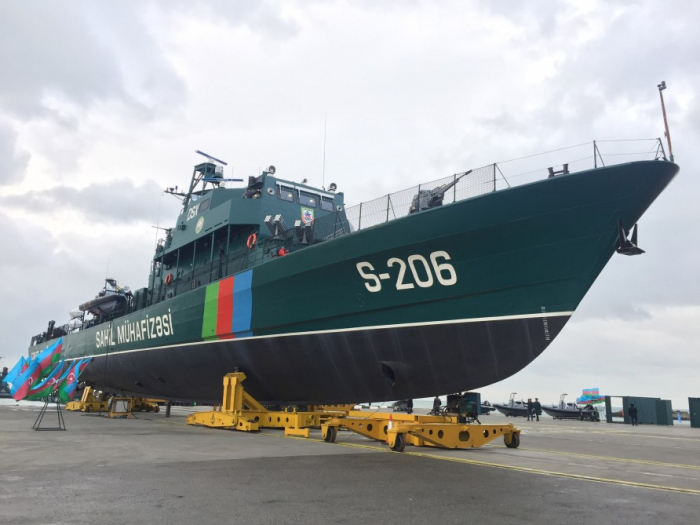 President of the Republic of Azerbaijan, Commander-in-Chief of the Armed Forces Ilham Aliyev has viewed a newly built "Tufan" type border guard ship, and military hardware, weapons and ammunition at the Shipyard and Repair Center of the Coast Guard of the State Border Service, AZERTAC reports. Chairman of the State Border Service, Colonel-General Elchin Guliyev reported to Commander-in-Chief of the Armed Forces, President Ilham Aliyev. Elchin Guliyev then informed the head of state of the work done. President Ilham Aliyev was submitted the project of the Savalan type state-of-the-art border guard ship, as well as new high speed craft, and towing vessels built as part of the Milli Boat program. President Ilham Aliyev watched a film highlighting the construction of the border guard ships of the Coast Guard and familiarized himself with their technical indicators. The President then viewed the State Border Service`s new special military hardware, weapons and ammunition. Mobile food processing machinery, as well as technology for the repair of border guard boats were also demonstrated. President Ilham Aliyev then familiarized himself with the newly-built Tufan type border guard ship.